In retrospect, my conversation with Michelle the Friday evening before the race about my goal time of 1:40:00 is almost comical. However, before I get there I want to explain how I arrived at one of, if not the, best races I've ever run. 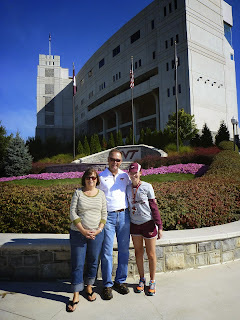 When I first heard that there was going to be a Blacksburg half marathon this fall, I was pretty excited about the idea of thousands of Hokies running together through the streets of Blacksburg and what an awesome backdrop downtown Blacksburg would provide for a finish (missed opportunity #1). Alas, it was not to be but the race that Runabout Sports put together was phenomenal and an excellent first annual event! Michelle and I have arrived at the conclusion that we prefer events or "experiences" for gifts from one another because they seem to be more memorable than an item with a finite lifespan. (Perhaps this is why people give jewelry?) It's for this reason that I asked to run the event for my birthday in a few weeks...I just lucked out with when they scheduled the run and received my birthday present a little early! My "training" like always wasn't stellar leading up to the race or should I say more specifically my training wasn't specific? Now, often in my "race reports" I avoid using the word race and prefer to say run but when I lined up two Sundays ago, I had every intention of racing. I digress. Because of the lack of specificity in my training regime and the fact that I had run Iron Mountain 30 miler only 15 days prior, I wasn't optimistic for a PR but thought given the right conditions I may be able to have an okay day. Additionally, the fact that I was familiar with the course gave me added confidence that if I was having a good day and the legs felt good, I would know where to push it and where to ease off. Training by month leading up to the race. Training by week leading up to the race. I didn't do much running the week leading up to the race but managed to get in an easy run out in Pandapas on Tuesday followed by a quick 5 mile run Wednesday evening. They were calling for absolutely perfect running weather Sunday morning, in the mid. 50's for the race, and I knew that given the right conditions I could run sub-1:40. 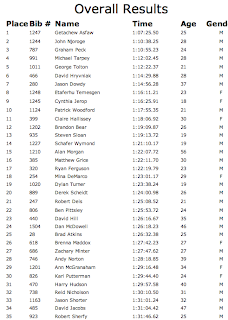 I didn't bother crunching the numbers using a pace calculator but knew that I need to run somewhere in the 7:30's to run sub-1:40 based on my previous half marathon PR of 1:42 back in 2011, at the Charlotte Half Marathon. Saturday was relatively low key for us. We spent most of the day at Michelle's parents watching the embarassment that was the Virginia Tech vs. ECU game before heading back to Blacksburg for packet pickup at the Virginia Tech Inn. Packet pickup was rather painless and Runabout Sports made an effort to put together a small expo at the Inn for race participants. I tried on a pair of Hoka Stinson's and felt like I was wearing moon boots (they were awesome!) and may be curious to give them a try come winter when I begin putting in big miles for Umstead. They also had the usual variety of nutrition and other "running expo" products folks would want to pick up for a race. Michelle and I at packet pickup. I repeated this quote over and over during the race on Sunday knowing that I often fall victim to self-sabotage. The best part about doing a local race is being able to sleep in your own bed. Adding to the awesomeness of close-to-home races is the bonus of not having to wake up 3 or 4 hours before the start of the race to get to the race location but rather leaving an hour before the race is scheduled to start. We woke up around 5 and had a quick breakfast, I decided to deviate from my normal banana-honey-peanut butter bagel, and opted instead for greek yogurt, banana, and a cup of coffee. We left the house just after 6 and arrived at the race start a short ten minutes later, not bad for a commute to a race. We made the necessary stop upon arriving at the giant row of porta-pottys, I have to give them credit here - there were plenty of porta-pottys for the number of runners, and then played the "hurry up and wait game" as we waited around for the race to start. Around 6:45, I headed back to my car to drop off my jacket and head out for a quick warm-up, which I think is one reason why I had a really great race. I arrived back at the start just a few minutes before the gun was scheduled to go off, just in time for the national anthem, and searched for Michelle and Shannon to wish them good luck with no success. After a few minutes of searching, I had to give up and found a spot maybe 20 or 30 feet back from the start line. I knew going into the race, it was blatantly obvious at the start, how many folks didn't know how to line up appropriately for their predicted time (missed opportunity #2, coral start). From a logistics standpoint, the location of the race start wasn't bad because it provided ample parking and convenient location, and while the Corporate Research Center (CRC) isn't an eyesore it isn't exactly picturesque nor does it represent Blacksburg very well. Although I didn't mind the start location, if the course changes in the future, hopefully it does, we wouldn't be missing anything. The race started on a slight uphill headed toward the 460 business/460 bypass junction, which was a good way to get legs going but again wasn't really anything special scenery wise. The course then made a right onto South Main St/460 Business, which is where my issues with the course selection began (just before the 1 mile marker). The participant limit was set at 3000 entrants, which was significantly more than they had register (~1200) but it supports their decision for including South Main St. as a significant portion of the race, roughly 2.5 miles. However, of all the roads in the Blacksburg/Christiansburg area it is by far the ugliest and least scenic of roads not to mention the poor condition of the road surface as a result of the harsh SW VA winters and copious amounts of road kill (missed opportunity #3). I found a group of runners that were running my pace and locked onto them for the next few miles ticking off 6:55, 7:04, 6:53, and 6:52 splits for the first four miles. The Christiansburg High School marching band was at the New River Valley Mall (mile 3), which gave me a nice little lift as I had a brief moment of doubt in my ability to maintain my current pace for the remainder of the race. 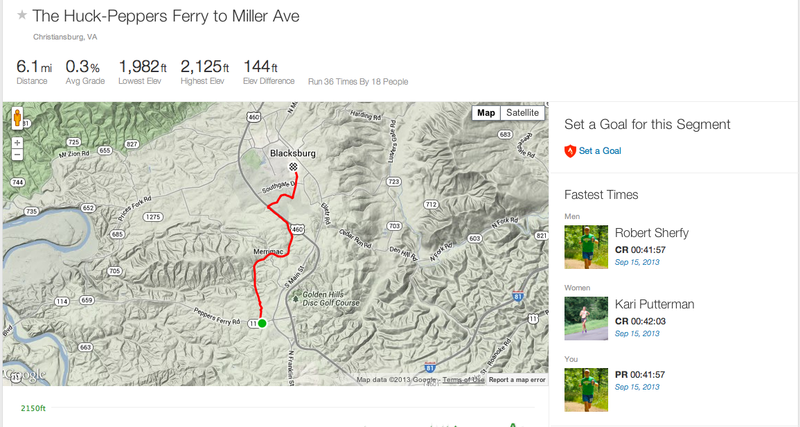 When I hit the start (although technically the end mile ~6) of the Huckleberry Trail, I opted not to take water and continue toward Blacksburg locking onto folks in front of me and slowly chasing them down. I was feeling really good until mile 7 when I began wondering whether I had gone out too fast but did my best to stay with the folks I was around and pushed through a rough patch, only adding 8 seconds on the next mile from 6:49 (mile 6) to 6:57 (mile 7). The next few miles felt pretty good and because the territory was familiar I think I had a little advantage to push hard on the rollers that I've run countless times during training. I picked up a GU just before mile 9 and a cup of Gatorade but decided against taking the GU because I didn't have any water with me to wash it down. As I approached Tech Center Drive running up the biggest hill on the course, I knew that after I reached the top I would be able to hit my goal of sub-1:40 even if I ran 9 min./mi. 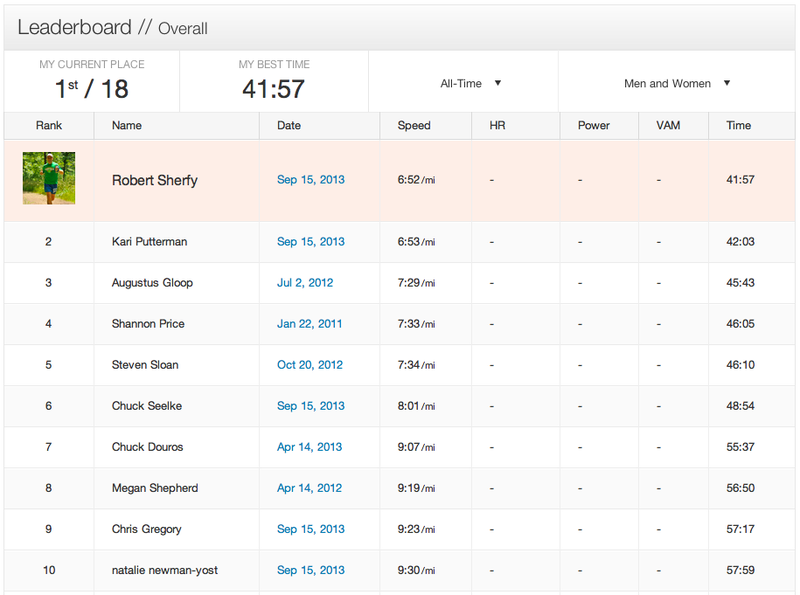 for the last 4 miles but returned to the Richard Byrd quote above and thought about what I had left in the tank. I got a boost at the top of the hill when I spotted Jordan Chang at the intersection of the Huckleberry and Tech Center Drive who gave me some words of encouragement. 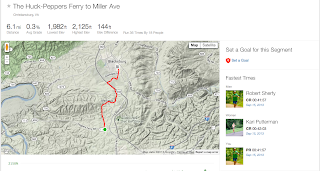 I then began the only section of the course with two way traffic, passing the eventual winner of the race going the other direction (3 miles ahead of me)(missed opportunity #4, the Huckleberry Trail is really too narrow for two way traffic). A group of three or four of us stayed together and pushed the pace as we reached the end of the Huckleberry Trail section (really the beginning mile 0.0) running my final sub-7 minute mile of the race before making a U-turn onto Preston Street, what I thought was the last hill on course. I could tell I was beginning to fade as I approached the 11 mile mark. I found another gear when I hit the short 1/2 mile section where the trail had two-way traffic and I was passing lots of runners going the opposite direction, most of whom provided words of encouragement as we were spread pretty far apart. Unfortunately, quite a few of the folks were completely oblivious to the fact that people were coming the other direction and were running on both sides of the cones going toward downtown which didn't slow me down but made me expend extra energy to tell them to get out of the way. Mile 12 was desolate. The d-shaped loop only has one building along it and is mainly empty fields, which made it drag on forever. At the end of the loop right before making a right back onto Tech Center Drive there was an awesome band just in the middle of nowhere jamming out some good country tunes. Finally, I made what I thought was the final turn into the CRC only to see a beast of a hill ahead that I had no idea was on the course. This hill absolutely destroyed me. The one advantage to this unnecessarily large hill at the end of the race was a downhill finish. Gravity was pretty much the only thing moving me forward at that point. I watched the clock as I came down the hill and was happy to finish under 1:32. One awesome outcome of the race was having the fastest Strava time for the Huckleberry trail, even if I do only have it for a short time. 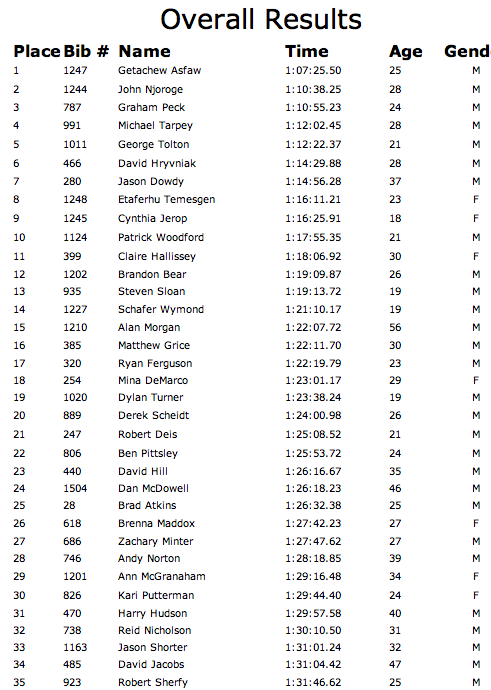 Overall, I placed 38th out of 1125 half marathon finishers (despite what it says above, 3 folks times were not recorded). I was pretty ecstatic with my finish time and knew that I had left most of it out there on the course. After receiving my medal and finisher shirt, I headed directly to my car and grabbed my jacket and phone so I could meet up with Michelle's parents who were on their way to watch her finish (missed opportunity #5, the shuttle buses bringing spectators to the finish were stuck where the Huckleberry crossed Tech Center Drive and most folks wound up having to walk). I also grabbed my Vuvuzela to encourage runners on the course. Another awesome thing about a race like this is that it brings out lots of folks in the community. I was able to chat with a professor from last semester, who embarrassingly beat me by a little over two minutes, and one of my current professors and say hello to their families. I eventually met up with Michelle's parents and we were able to see Michelle and Shannon finish, both of whom looked like they were having a great time! Michelle and Shannon enjoying the downhill finish! Shannon, Michelle, and I at the finish (Vuvuzela in hand)! We grabbed some of the post race food before heading toward the car and lane stadium to grab some finisher photos! 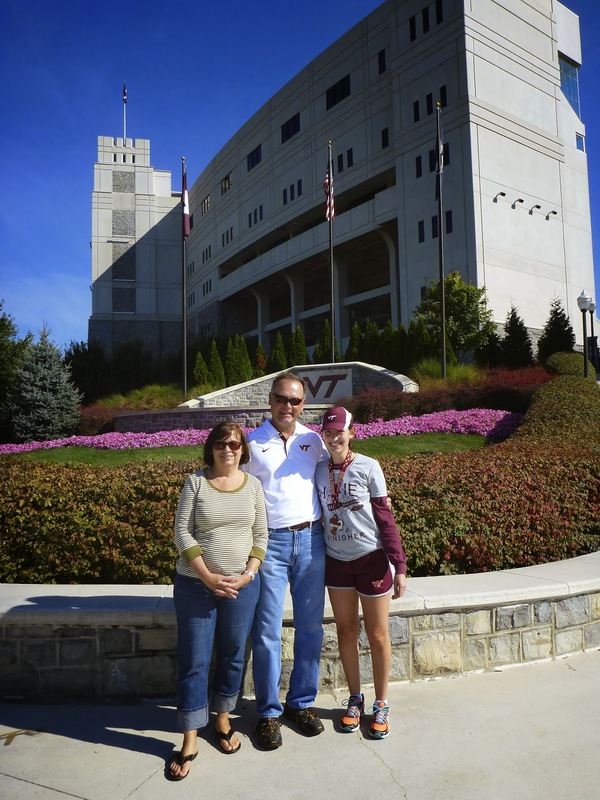 Michelle and I infront of Lane Stadium. Overall, the race was an excellent first annual event that has tremendous potential to be a "must-do sell out" type of race. That being said, there are a few things in my opinion that need to change for us to consider doing it again next year. 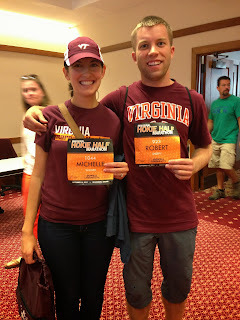 Michelle and I both agree, and most of the folks that we talked to after the race, that the BIGGEST missed opportunity was lack of coordination with the Blacksburg Brew Do, a craft beer festival at the First & Main Shopping District. The Brew Do was held on Saturday, and perhaps James and the organizers wanted to stay away from associating with a beer festival but scheduling the race the day after certainly prevented folks from attending one or the other. I would like to see a partnership where participating in the race gets you free entry into the festival or coordinate the finish into the festival. At a very minimum, schedule the events the same day so that folks are not forced to choose between one or the other. Perhaps it will convince even more folks to participate. I think it's also important to note the constraints the football season places on the scheduling of the race, which means the weekend the race falls on will likely fluctuate as a result. The course leaves something to be desired - I think James and the folks at Runabout did a great job for a first annual event but considering how often Main Street is shut down for festivals in Blacksburg (Steppin' Out, Summer Solstice, etc.) I don't see why something similar could not have been arranged. It really comes down to establishing a course that is memorable and promotes a sense of community where non-particpants are inclined to come out and cheer on the runners. Additionally, the parking location for spectators and shuttle arrangement left folks stuck on buses and missing their friends' finish. Registration cost was too high for early registrants and compared to other comparable races - The lowest registration cost for a runner was $80, which is on par with a registration fee of early registrants for a full marathon. I think it comes down to establishing expectations. Personally, I would expect to pay in the neighborhood of $50 to $65 for a small town, and first annual, half marathon. By charging $80, for me at least, Runabout sports set the expectations very high and while I was happy with the event I could've done without two-shirts and a $15 finishers medal. Yeah, it's neat but it should be an option to reduce cost for participants who aren't really interested in all of the extras. Shirts were not true to size - I heard this across the board. The long sleeve shirts that participants received at packet pickup were a size small for both men and women. For me, I didn't really mind because I have a pile of race shirts but for Michelle and Shannon, who wound up with 3/4 length sleeves which were supposed to be long sleeve and shirts that revealed their navels, it was disappointing. This was obviously outside of Runabout Sports control but was disappointing none-the-less. Overall, the race was awesome, and we had a great time. I think the event has huge potential to be a SW VA "must do" race, but there were a few missed opportunities that I'm sure James and the folks at Runabout Sports are aware of. Posted by Unknown at 5:05 PM , Links to this post , 0 comments I'm reading from MyDailyGround: 1st Annual Hokie Half Marathon (10 minute PR) Tweet this! 2014 Blue Ridge Marathon Entry Giveaway! @RBSherfy @BRM26pt2 This is awesome! My wife and I are training for the @Philly_Marathon looks like I will turn my focus to the BRM next! Back in early August, I announced I had been selected as a 2014 Blue Ridge Marathon Blogger and detailed in the post that one of the benefits to you guys would be the opportunity to hold a giveaway here on the blog for a free entry. My week begins today, actually this morning at 12:00AM and runs through next Sunday (September 15) until midnight (EST). I decided to use the Rafflecopter widget for this giveaway after learning a few things from my North Face ECS Georgia or Wisconsin giveaway, which closes tomorrow. The winner will be chosen via the Rafflecopter widget below. The winner will receive an entry into the 2014 FULL 26.2 Marathon. The winner will receive a code via email to waive the registrations cost & online registration fee. No airfare/ travel expenses included, no lodging included, no pasta supper included. You can receive an entry Daily for tweeting about the contest so make sure you come back each day to enter via the widget. That's it! Pretty easy! If you have any questions or comments feel free to contact me or leave a comment with a question below. Like I mentioned above, I'm learning with this contest and new to the Rafflecopter thing so bear with me. 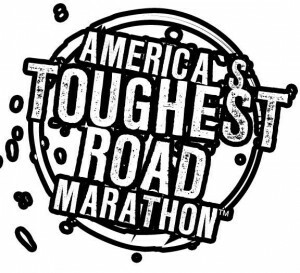 In case you're not familiar with the Blue Ridge Marathon, check out this awesome video about "America's Toughest Road Marathon"
Posted by Unknown at 9:01 PM , Links to this post , 4 comments I'm reading from MyDailyGround: 2014 Blue Ridge Marathon Entry Giveaway! Tweet this!